The only ever marinara sauce I have ever loved was my mothers, I have never actually asked her how she makes it, not sure why, just never have. So when my husband went off to the fish markets one day and said he felt like spaghetti marinara, I went on a search for a recipe as I had no idea how I was going to make it. As per normal he bought too much seafood. I told him not to get the premade marinara mixes, as 1. they can be sandy and 2. not all seafood cooks at the same rate. When you individually buy the seafood, yes, it is more expensive, but you add the seafood when it needs to be added, so it does not overcook. Now also as per normal I always follow a recipe as it is written the first time. So the photo below is what we served up. It was nice, looked great, but it just wasn't perfect. For me, it wasn't saucy enough and I now know I don't like calamari in my marinara sauce, it just didn't work for me, all the other seafood was perfect, just the calamari I could do without. So the following day, as I had enough of the seafood to make another sauce, I decided I would change the way I cooked this sauce. 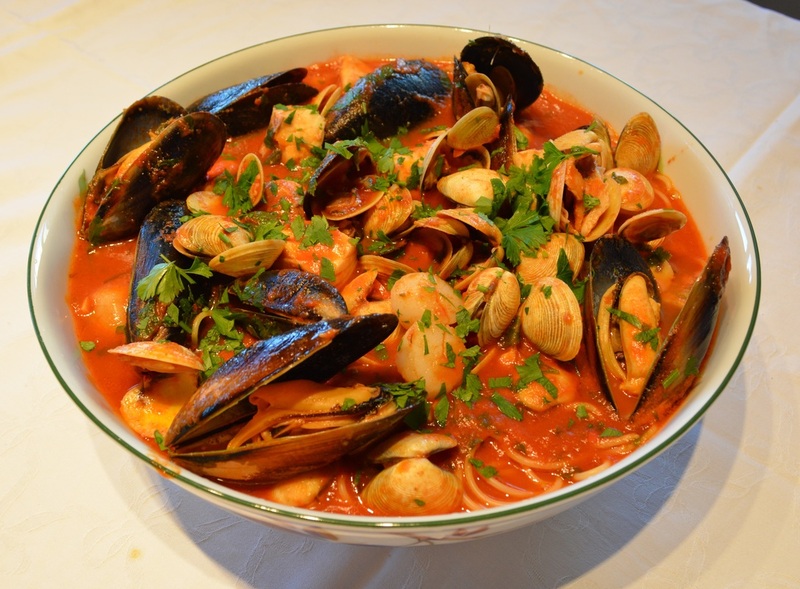 Now I combined a recipe I use when I make spaghetti with clams with this recipe. And the results were amazing. This time the flavours were all there, the pasta was saucy and all the seafood was perfect, I left out the calamari this time. Now for a few notes: I used a whole bottle of tomato passata, as I did want it really saucy, you could use half a bottle if you want it a little less saucy. Also with the prawns, I always have frozen Australian prawns in the freezer, they defrost quickly and are perfect for dishes like this. Please do add chilli as the sauce will taste better with it. With the fish, I like to use a thick fillet, as it is less likely to overcook. Prep and chop everything you are using before you start, as once you start adding the seafood, this dish will cook quickly. Heat the olive oil in a large frypan over medium-low heat, add the garlic, anchovies and chilli, cook, stirring for about 1-2 minutes, you want the anchovies to melt away, but you don't want the garlic to burn. Add the tomato pasata, season with salt and pepper. Once it comes to the boil, simmer 10 minutes. Add the water, vegeta and wine, bring to the boil, simmer 10 minutes. Add the pasta now to pot of boiling water, cook it until just cooked, please don't allow it to overcook. Once your pasta is cooked, drain it, then place in a serving dish, drizzle it with a little extra oil, then toss, this stops the pasta sticking together. 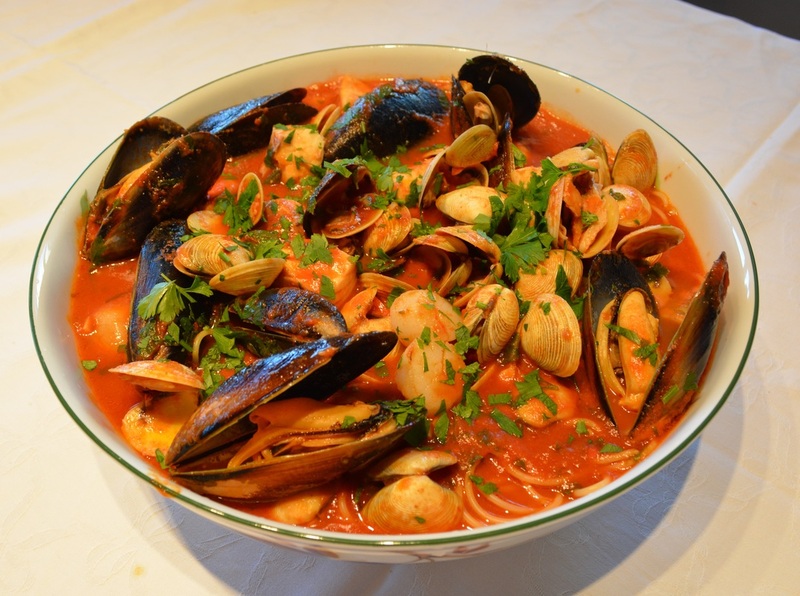 While your pasta is cooking, add the mussels to your sauce, cover with a lid (if your frying pan does not have a lid use a round pizza/baking tray as a lid, works just fine) and simmer for 3 minutes, shaking the pan occasionally. Now add the pipis, fish, prawns and 3 tablespoons of the chopped parsley, cover again and simmer for 2 minutes, shaking the pan occasionally. Finally add the scallops, cover and cook for 1 minute. By now the mussels and pipis will have opened and all the other seafood is cooked. Taste your sauce for seasoning, add salt and pepper if needed. 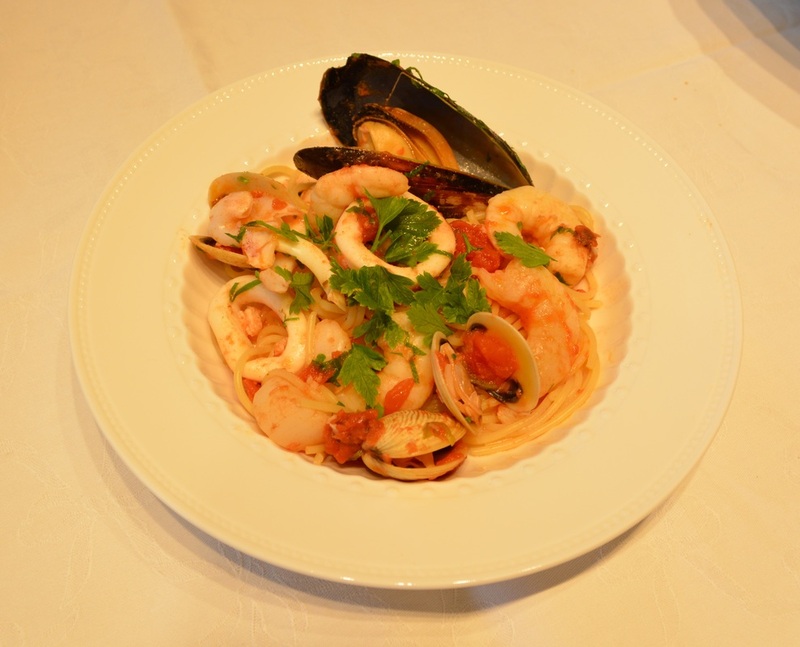 Add your sauce onto your pasta, toss lightly, I like to have the seafood showing. Scatter over the remaining parsley leaves.